On the occasion of the International Women’s Right Day, we would like to put in the spotlight the less represented pilots side in the balloon community: women. Why, what are the reasons, what is the hot air balloon vision from women’s side, what are the drags or advantages… The floor is given to Mélanie Martignon, a pilot woman who always dreamed about hot air balloon. A dream which has quickly become a reality. Good morning Mélanie! How did this passion for the hot air balloon came to you? When I was a child, I used to accompany my dad on hot air balloon gathering in Metz, Louvigny and during summer on Chambley aerodrome to see mass ascents, early in the morning and during the night as well. It was magnificent and a bit magic! During the 1995’s edition of the Biennale mondiale de l’aérostation (which has become Mondial Air Ballons then Grand Est Mondial Air Ballons), we got the opportunity to meet a couple of pilots which took us in the air. We helped them for all the edition’s flights and we flew with them, sometimes with the man, sometimes with the woman. I believe I caught the balloon virus that year… For the 1997’s edition, we joined in family the Volunteer team of the Biennale Mondiale de l’Aérostation. I was 14. How old are you, when did you become a hot air balloon pilot and what did make up your mind? What do you prefer as a pilot? I am 35 and I got my pilot’s license in July 2014, I was 31. I was dreaming about becoming a pilot since my dad has become one. The fact that he made it enabled my dream to be a reality. I waited until I finished my studies then I found a stable living situation before getting in the adventure. The day I realized I am physically able to be a pilot, I went for it and asked Philippe Buron Pilâtre if he accepted to teach me. I wanted to be a pilot to discover the sensation to surf overhead wheat fields, to brush the tops of the trees. I found it exhilarating as a passenger, that floating sensation, but as a pilot, holding a landing close to the cereals, following the ground’s drop, feeling just one with the nature… This is what I like, what is magic. A sensation that I only know in hot air balloon. Did you face any complicated situation in your way to become a pilot? Sorry but I don’t remember about any situation like this. I probably lived the same training as every pilot trainee, with progression and stagnation periods. I was lucky enough to start my training after fifteen years of experience as a crew member, then ground’s action skills were acquired. I also benefited from experience sharing of the pilot’s community that I know since I am 12, which is very instructive as a young pilot. Do you know other women pilots? How do you explain that women are fewer than men in the pilot’s community ? Yes I do know other women pilots. Some of them are in the same association as me, I met some others during hot air balloon gathering or competitions. I think that if women are, for now, fewer than men in the pilot’s community, it is especially cultural. But I must admit that I do not pay much attention to my interlocutor’s gender. I meet hot air balloons passionate, women, men, adults, children, pilots or not and this pluralism makes our exchanges fruitful and interesting. Do you find hot air balloon a sexist field? No, I do not find the hot air balloon field more sexist than the rest of our society. Maybe because I am practicing this passion in family, within an environment where I am appreciated and respected no matter my gender. But even during balloon gathering, I never got any sexist word, either lived any behavior which could let think about sexism. Actually, it is the contrary: I really feel a goodwill and mutual aid within the balloonist community. We are likely to think of the hot air balloon as a man’s sport, as we mostly see them flying these machines. What is your mind on that question? For a long time I also thought that it was a man’s sport, which needed a lot of physical strength. A strength that I did not think I had. 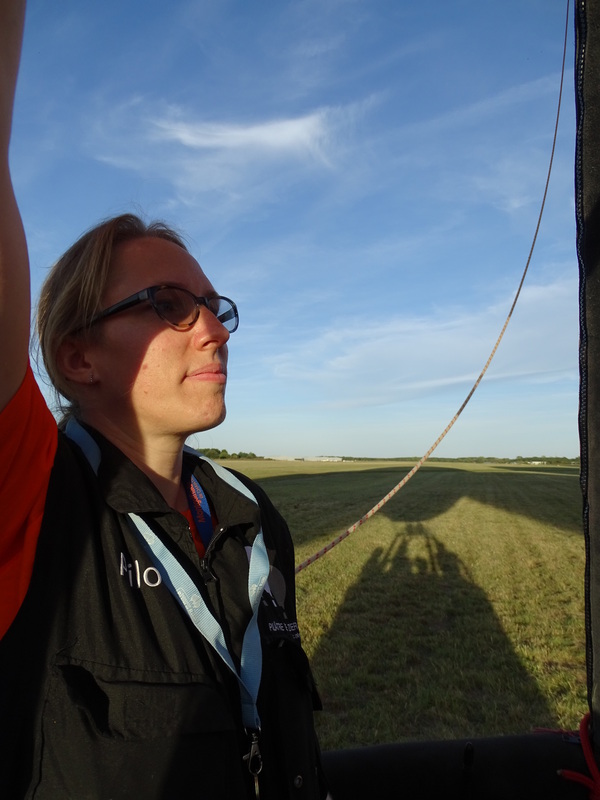 Then I remained a loyal crew member, I was part of the balloon installation: carrying the basket, the balloon envelope, the blower, the gas bottles… And I was also part of the balloon’s storage after the landing: same thing the other way round, putting everything in the trailer. One day, I realized that the pilot is not carrying more than the crew members. I was already doing the most difficult physical thing, since I was 15. Of course the equipment is heavy to carry, but the hot air balloon is a sport team. The points I am not very comfortable with, and I am not wonderful at, are all mechanics dimensions: repairing the burner or the trailer’s electricity… But this is only an appeal matter, for example I do not like either to cook and it is not linked with the fact that I am a woman. Those elements are just outside of my interest, that’s all. In contrast, I really care about the wellness of my passengers. But I also was interested about the feeling of the passengers when I was a crew member, my pleasure was to see them getting out of the basket with their eyes full of stars. This is a part of me, a personality matter, nothing about the gender or a pilot’s license. I think that we are the pilot man or woman that we also are in the daily life. To conclude, I do not think that men are more qualified than women to be pilots, neither the opposite. I believe in an individual aptitude independent of our gender, but guided with our experiences and our way to be. What would you like to tell to women who are dreaming about it but do not try it? Well, I would say a french expression meaning ‘who tries nothing has nothing’. It is not unattainable, they must dare to go for it. I wish to all people interested in the experience to be able to discover both pleasure and serenity brought by a hot air balloon flight.